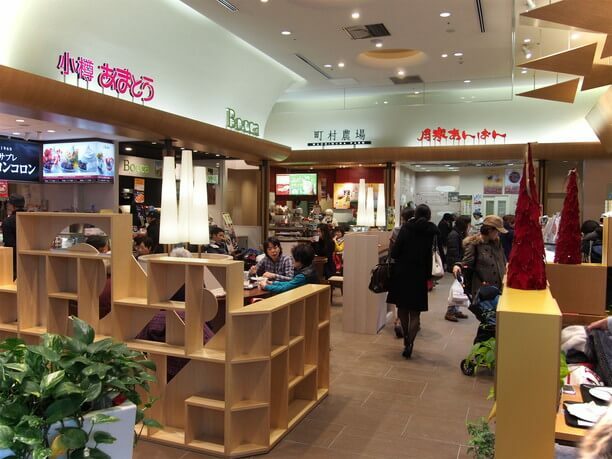 Odori Bisse is a multi-purpose commercial facility where you can enjoy meals, sweets, and shopping. 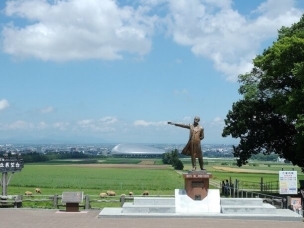 It is located at the corner of Odori Park on station road. 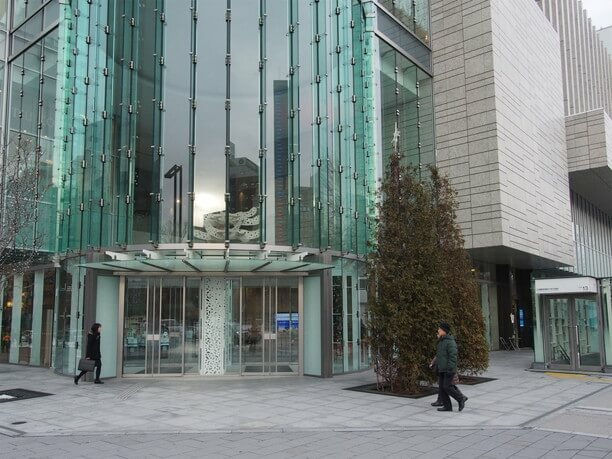 It is a bluish glass-enclosed building that can be accessed along the underground walking space “Chi Ka · Ho” (that connects Susukino to Sapporo Station) so it is easy to access in any weather! Inside there are a lot of popular shops such as, YUIQ (that has attractive gems gathered from around Japan), Sommesaddle (with leather products made by a well-known harness manufacturer), and Farmers Herb (dealing with herb tea raised at Kitami City’s own farm) There are plenty of stores where you can find souvenirs and other items you are looking for! One of the most popular stores is Bisse Sweets, where you can find some of Hokkaido’s most famous sweets and dessert shops in one place! You can choose your favorite sweets from famous 6 stores in Hokkaido! From West 3rd Street at Odori Park, cross the north traffic light and enter the building of Odori Bisse, there is Bisse Suites on the left side. 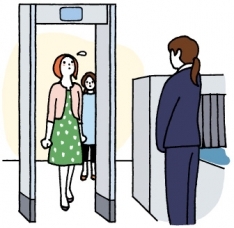 From underground, take the escalator or elevator to the first floor. 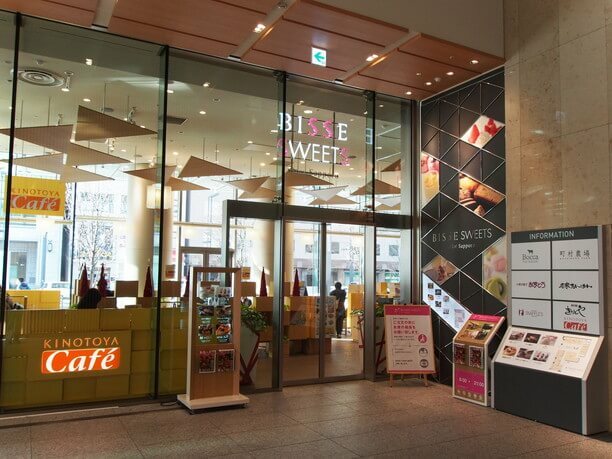 Bisse Sweets is a collection of six well-known shops in Hokkaido, that are well known throughout the country. There are 86 seats spread around tables all over the store. You can sit and eat at a table near whatever shop you buy your treat at (there is also a sofa seat). 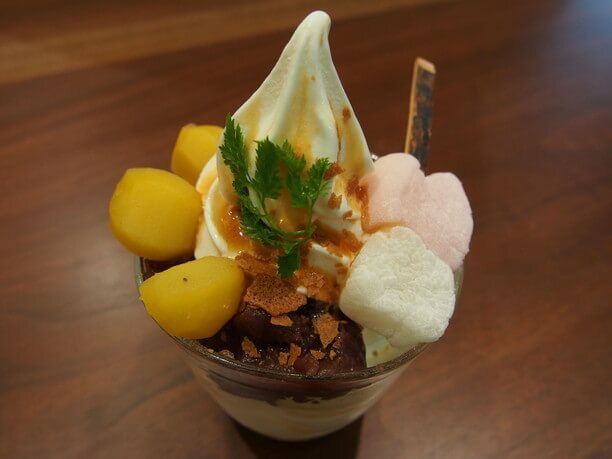 In warm weather, it is fun to have sweets and soft serve ice cream while feeling a refreshing wind on the terrace where you can enjoy looking at the flow of people walking around the station. Kinotoya Cafe serves an Omupafe which is only available at this Odori Bisse story! At “Kinomoto Cafe you can choose your favorite cake from the showcase and have it in a set with coffee or tea (hot, or with ice) (Regularly 750 yen, 600 yen from 8 a.m. to 11 a.m.). 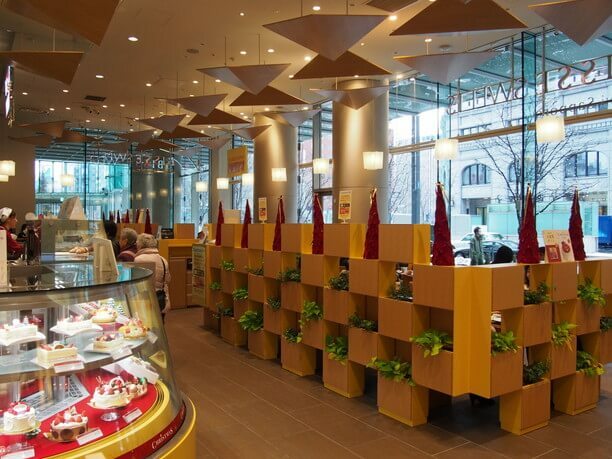 Their popular treat, Omipafe is only available at this Kinomoto Odori Park store. 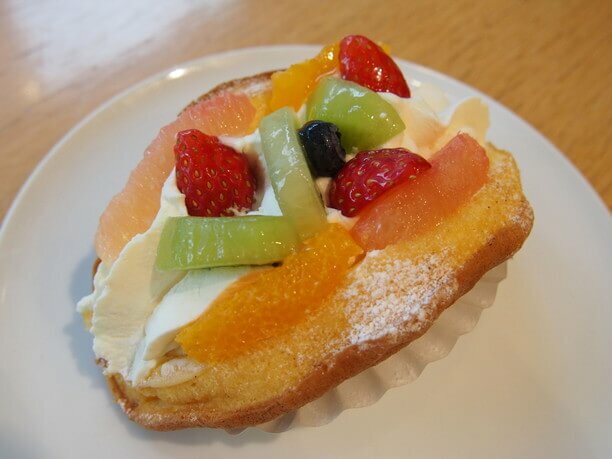 It has a lot of fruits such as strawberries, kiwifruit, oranges, blueberries, with fresh cream in a fluffy dough omelet. On the inside it has bananas, custard cream and azuki beans. In the morning they have a croissant set from 8 AM to 11 AM only. They use ingredients imported directly from France. The croissant is baked in the shop and has a rich buttery scent and crispy texture. 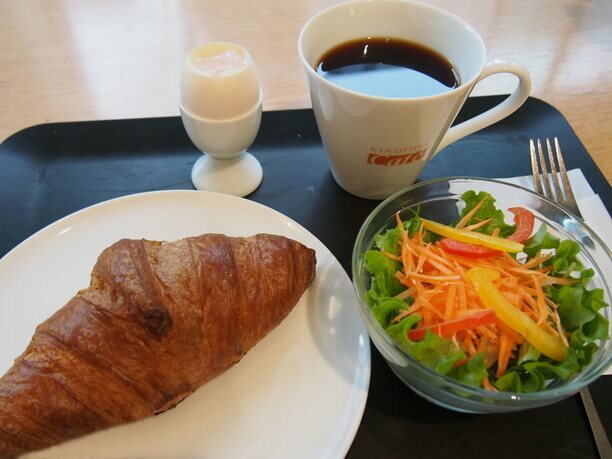 The set also includes a boiled egg, plenty of coffee and fresh salad for 550 yen. 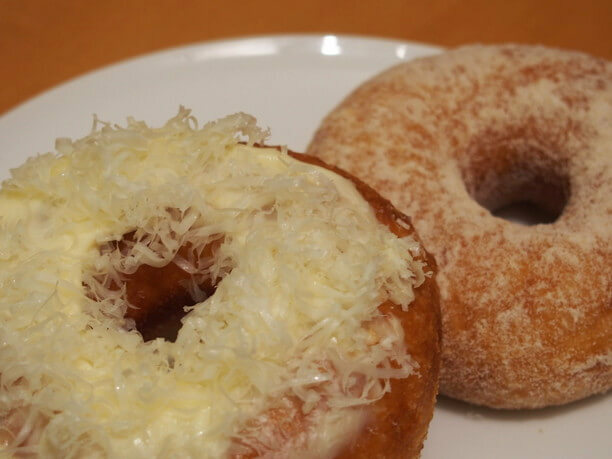 Machimura Farm uses fresh ingredients to make their soft serve ice cream and cheese donuts! Above is a picture of their milk soft serve ice cream (341 yen). It has a rich but not too sweet and refreshing taste. They use plenty of fresh milk from their own farm. It goes very well their delicious waffle corn. They have many customers. A mini size is also available for smaller children! Homemade donuts made in the store’s kitchen are also very popular. They use milk and butter from the farm and natural yeast. If you enjoy the deliciousness of a simple milk donut we highly recommend one of these (184 yen). The most popular is their cheese donut (238 yen). It is made with sweet and sour cream cheese and covered in gouda cheese. They are ideal to take out and enjoy while sitting on an Odori Park bench. Enjoy a Cream Zenzai at Otaru Amato, found only here in Sapporo! Otaru’s Amato is famous for their ice cream Zenzai. It is only found at Odori Bisse in Sapporo. The photo is of a soy sauce cream zenzai (Small size for 500 yen). At first it seems like an unexpected combination, but together the taste is delicious and very popular. According to the manufacturer (Amato) it takes three months to develop the sauce. 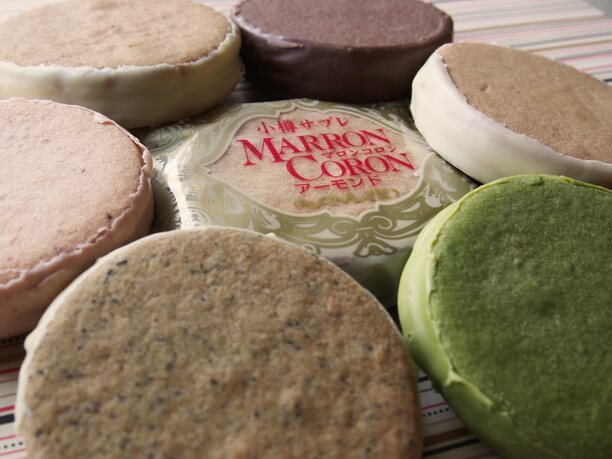 Speaking of Amato’s sweets, they also produce a Maron Coron (170 yen). It is a three-layered biscuit covered with original chocolate. They also have their Ichigo Maron Coron (190 yen). It uses freeze-dried strawberries. They have two premium biscuits of tea and Matcha (160 yen). They are good to eat by themselves, but it is a luxury treat (unique to Odori Bisse) to taste on ice cream zenzai. Another popular shop is Bocca. It is known for selling Hakodate’s City’s “pastry snaffles”, and “Azuki beans bread,” from Sapporo. Enjoy lunch at Dullandelle after your sweets! Their panoramic salad is full of tasty ingredients! 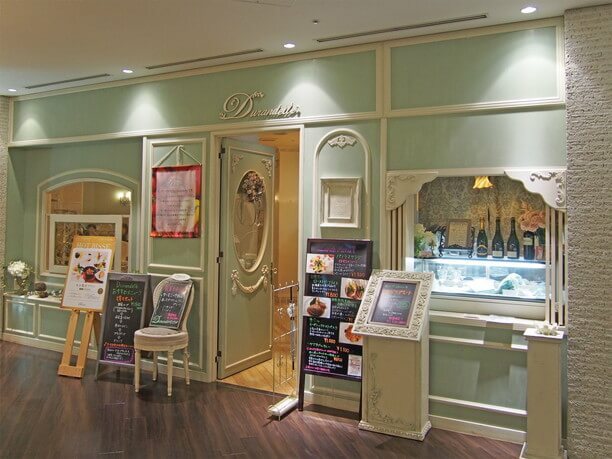 Odori Bisse has 10 restaurants where you can enjoy lunch and dinner. 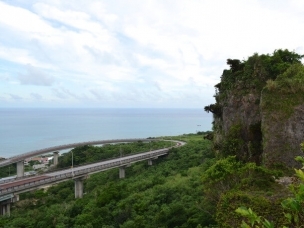 Among others there is the “43 ° Steak House” known for its steak of well-bred local beef and “Kirika” a Chinese restaurant” with creative Chinese. specialties, and ” Dullandelle (Duranderu)” an organic restaurant that we highly recommend for a meal before or after the sweets. 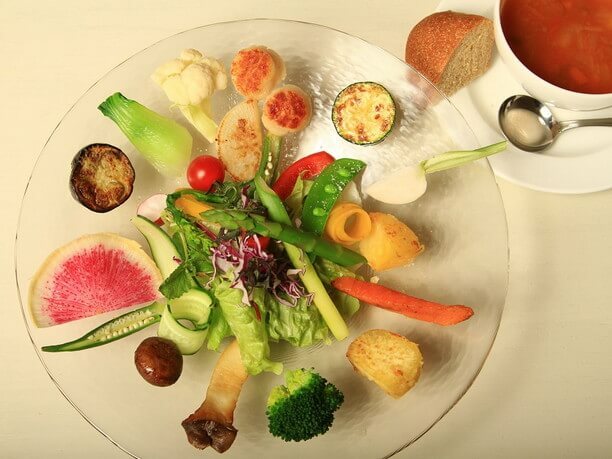 At Dullandelle you can have delicious French food made with ingredients from selected partnering farms and ranches in Hokkaido. Their “Panorama Salad” has a beautiful appearance, like art arranged on a pallet. It is 1,300 yen and comes with homemade bread or rice. It is has been a popular menu item from the time the store first opened. It is enough food to leave you feeling satisfied! 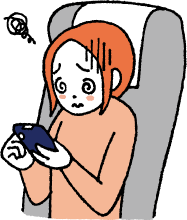 You can add a drink for an additional 200 yen. It is a small shop, where people take their time to enjoy their meal, so it is best to call and make reservations in advance! (011- 206 – 936). In Bisse Sweets there are five shops that sell soft- serve ice cream, so you can buy it after several shops and compare to find your favorite! Bisse Sweets has long business hours. Kinotoya Cafe is open from 8 AM to 9 PM and some other shops are open from 10:00 AM to 8:00 PM or 9:00 PM so it is easy to shop there in conjunction with other tours and traveling activities. Bisse Sweets is crowded most of the time, but lunchtime between 11 am and 1 pm is less crowded because many are eating lunch in other places at this time. There are some shops that do offer a limited lunch menu with their deserts. The sweets of Kitakaro Sapporo main building are engraved with the history Hokkaido! 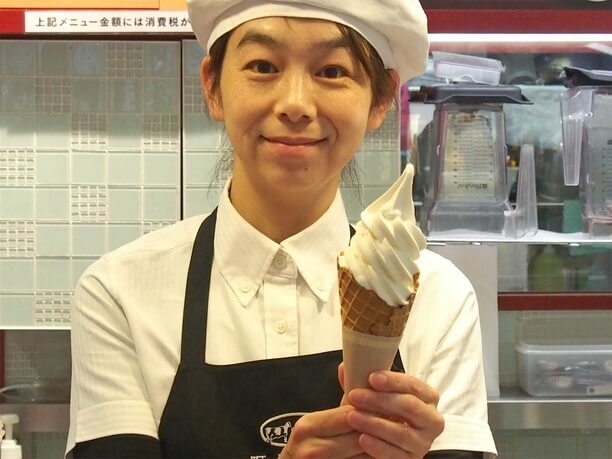 Come to Sapporo Milk House and enjoy their Softserve ice cream with plenty of raw milk!